With an Introduction and Analysis by Jowett. 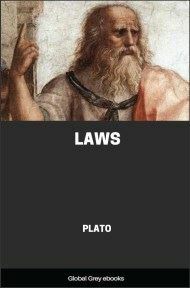 The Laws is Plato's last and longest dialogue. The conversation depicted in the work's twelve books begins with the question of who is given the credit for establishing a civilization's laws. Its musings on the ethics of government and law have established it as a classic of political philosophy alongside Plato's more widely read Republic. Athenian. And do you, Cleinias, believe, as Homer tells, that every ninth year Minos went to converse with his Olympian sire, and was inspired by him to make laws for your cities? Cleinias. Yes, that is our tradition; and there was Rhadamanthus, a brother of his, with whose name you are familiar; he is reputed to have been the justest of men, and we Cretans are of opinion that he earned this reputation from his righteous administration of justice when he was alive. Athenian. Yes, and a noble reputation it was, worthy of a son of Zeus. As you and Megillus have been trained in these institutions, I dare say that you will not be unwilling to give an account of your government and laws; on our way we can pass the time pleasantly in about them, for I am told that the distance from Cnosus to the cave and temple of Zeus is considerable; and doubtless there are shady places under the lofty trees, which will protect us from this scorching sun. Being no longer young, we may often stop to rest beneath them, and get over the whole journey without difficulty, beguiling the time by conversation. Cleinias. Yes, Stranger, and if we proceed onward we shall come to groves of cypresses, which are of rare height and beauty, and there are green meadows, in which we may repose and converse. Cleinias. Very good, indeed; and still better when we see them; let us move on cheerily. Athenian. I am willing — And first, I want to know why the law has ordained that you shall have common meals and gymnastic exercises, and wear arms. Cleinias. I think, Stranger, that the aim of our institutions is easily intelligible to any one. Look at the character of our country: Crete is not like Thessaly, a large plain; and for this reason they have horsemen in Thessaly, and we have runners — the inequality of the ground in our country is more adapted to locomotion on foot; but then, if you have runners you must have light arms — no one can carry a heavy weight when running, and bows and arrows are convenient because they are light. Now all these regulations have been made with a view to war, and the legislator appears to me to have looked to this in all his arrangements:— the common meals, if I am not mistaken, were instituted by him for a similar reason, because he saw that while they are in the field the citizens are by the nature of the case compelled to take their meals together for the sake of mutual protection. He seems to me to have thought the world foolish in not understanding that all are always at war with one another; and if in war there ought to be common meals and certain persons regularly appointed under others to protect an army, they should be continued in peace. For what men in general term peace would be said by him to be only a name; in reality every city is in a natural state of war with every other, not indeed proclaimed by heralds, but everlasting. And if you look closely, you will find that this was the intention of the Cretan legislator; all institutions, private as well as public, were arranged by him with a view to war; in giving them he was under the impression that no possessions or institutions are of any value to him who is defeated in battle; for all the good things of the conquered pass into the hands of the conquerors. Athenian. You appear to me, Stranger, to have been thoroughly trained in the Cretan institutions, and to be well informed about them; will you tell me a little more explicitly what is the principle of government which you would lay down? You seem to imagine that a well governed state ought to be so ordered as to conquer all other states in war: am I right in supposing this to be your meaning? Cleinias. Certainly; and our Lacedaemonian friend, if I am not mistaken, will agree with me. Megillus. Why, my good friend, how could any Lacedaemonian say anything else? Athenian. And is what you say applicable only to states, or also to villages? Athenian. The case is the same? Athenian. And in the village will there be the same war of family against family, and of individual against individual?